Elasto Plastic Concrete (EPC) is the leading global supplier of structural synthetic fibre reinforcement for concrete and shotcrete. EPC’s revolutionary BarChip fibres replace welded wire mesh and steel fibres. EPC formed in the late 1990s, when it recognised the benefits of structural synthetic fibres as reinforcement for shotcrete and concrete. Focused originally on the Australian mining industry, EPC quickly established the BarChip fibre brand as the leading structural synthetic fibre on the market. Within a few short years, EPC was supplying BarChip fibre for shotcrete ground control reinforcement to some of the world’s largest mining companies. 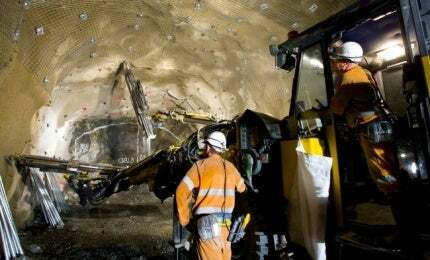 In less than ten years nearly every underground mine in Australia had replaced steel reinforcing with structural synthetic fibre, as well as mines in Europe, North and South America, Asia and Africa. EPC now provides ground control solutions to some the largest mining houses in the world, including BHP, Rio Tinto, Cadelco, Freeport, Newmont, Xstrata, Newcrest, Anglo America, Barrick, and many more. EPC built on success early, opening offices in North and South America, Europe and Asia. The company focussed on providing high-performance ground control solutions that improved performance, durability, efficiency and above all the safety of site ground control. This approach led EPC to supply some of the largest and deepest mine sites; Argyle, Cadia Valley Operations, Freeport Indonesia, Kennocott, Kiruna, Olympic Dam, Cannington and Chuquicamata. The ability to eliminate steel mesh and steel fibre corrosion is one of the key driving factors for SyFRS uptake in the mining industry. Results show that BarChip fibre-reinforced concrete maintains 99.8% of its load carrying capacity after one year of exposure, compared to only 54% for steel fibre alternatives with crack widths of only 0.1mm. Embrittlement is another process that severely reduces the durability (and ductility) of steel reinforcement but has no effect on synthetic fibre. As shotcrete strength increases with age, steel fibre anchorage can become too effective, leading to a rupture based failure instead of a pull-out failure. EPC has built its reputation on the strength of its people and its products, which have been tried and tested by major corporations and engineering experts worldwide. EPC’s commitment to product development is second to none. Since the first BarChip fibre, EPC has increased performance by 219% and at the same time decreased dose rates by 68%. As mining operations continue deeper underground, the associated ground deformations have resulted in highly demanding reinforcement systems. EPC’s BarChip synthetic fibres have proven time and again to be the best choice in these tough environments. BarChip synthetic fibre dramatically improves concrete ductility and enables controlled movement that allows for visual inspections of placed shotcrete. Testing at both 40mm and 100mm deflections shows BarChip does not corrode and maintains toughness performance across the full range of deflection. With thousands of kilometres of safely supported underground construction and a satisfied customer base that includes nearly every multinational mining house, you can guarantee the performance of EPC’s team and reinforcement solutions. Remedial works of the concrete structure well before the specified design life will yield additional cost to the owner due to loss of revenue and the cost of the works to rehabilitate the structure. EPC’S BarChip synthetic fibres deliver durability, ductility and superior toughness to shotcrete.